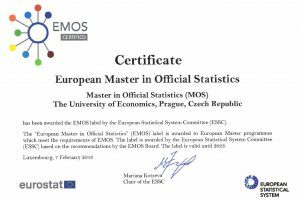 The accreditation European Master in Official Statistics (EMOS) is awarded by the European Statistical System Committee (ESSC) only to programs which fulfil strict requirements and offer high-quality education. IImportant is also cooperation with European and national statistical institutes, the programs include an internship in state statistical service. The academic guarantor of the MOS program is prof. Jakub Fischer, the Dean od the Faculty of Informatics and Statistics, the academic director is Petr Mazouch. The MOS program is taught only in English .